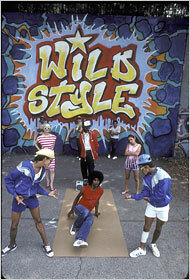 Our boy fu-quon posted the full-length film Wild Style the other day, a pinnacle of hip hop film achievement. If you haven’t had a chance to watch it yet, you totally should. This classic movie has just hit the 25 year anniversary mark and the New York Times has run a little piece trying to analyze it’s impact. Charlie Ahearn, the creator, was basically inspired to make this movie after talking to Fab 5 Freddy back in 1980. Amazingly enough, the movie would never have happened without the financing of two European TV channels. There just wasn’t any funding for the film in the States. This is the nuttiest part, I think. Mr. Ahearn was drawn to real people, rather than professional actors, for many of the roles. He enlisted three men hanging around one club where the production was shooting and gave them roles as stickup men. They took the roles, but not the prop starter pistol Mr. Ahearn gave one of them for the scene. That became the weapon that Lee and Patti Astor encountered outside the club, along with the line uttered at the beginning of this post. That was a REAL gun they were held up with in the film. MAN! Read the article, it’s a trip. Posted on January 9 by Twice. This entry was posted in Art, Hip-hop Film. Bookmark the permalink.